School Snacks for Weight Loss. Often it is difficult to stick to the ideal eating habits when we lead a busy schedule. School snacks for weight loss are important especially for those who engaged into a project that means to polish their silhouette. Mental activities as learning require more energy and implicitly calories. Therefore it is compulsory to consume the most nutritious ingredients from fresh vegetables and fruits to other elements. Finding out more on healthy eating is paramount to adopt a body- and mind-friendly lifestyle and last but not least get rid of extra-pounds. Consider the recipes below for the perfect school snack. Extra-pounds might have a harsh effect on our body as well as self-esteem. As a consequence teens often decide to engage into a quick fat loss diet. Often these might appeal to drastic methods and would leave them with the sense of constant starvation as well as sagging skin. However there's no need to torture ourselves with the fad fat flush eating programs when it is enough to eat healthy. Boosting our metabolism can be best done by choosing ingredients that are rich in fibers as well as vitamins. These would keep our silhouette and health in its best shape. Weight loss can be done in various ways, however an organism still in development might suffer from the effect of unhealthy dieting. Instead it is more advisable to read through the useful recipes for school snacks for weight loss that would set the slimming process on the right track. Pack your schoolbag with the most delicious foods that would do miracles with your body and also mood. Vegetables and Fruits: Some of the most healthy and easy-to-prepare school snacks are fresh fruits and vegetables. These can be packed and stored without any difficulties. Therefore make sure your lunch-box contains at least some of the most nutrient pieces. When it comes of fruits your are highly recommended to take some bananas as well as grapes and apples with you. These would fuel your mind and body with the necessary calories to survive the day and be active all throughout the activities and classes. Prepare a delicious fruit salad from these ingredients and place it into a medium bowl. You can also pick fresh fruit juices as a soothing beverage. However these should not contain additional sugar or artificial elements.The weight loss is guaranteed with a balanced diet. Yogurt and Fruit Smoothie: Nutritionist highly advise us to include yogurt and also fruits into our daily meal plans in order to be able to drop the pounds and eliminate the harmful toxins from the organism. One of the crucial conditions to master a similar diet is to purchase low-fat yogurt with delicious fruit pieces. The ones you'll find at the local store might have other supplementary elements that can sabotage your weight loss. Instead by the plain yogurt and add your favorite fruits to it to make sure it's an organic composition. Pack your bag with similar healthy school snacks for weight loss. Muffin:The traditional muffin is one of the delicatessen that can serve also as a stuffing and nutritious meal for a precious lunch. There's no need to restrict yourself to the simple recipes instead you can cover these cute cookies with some peanut butter, strictly of a low calorie one. Additionally you can add peanuts as well as banana slices as the perfect topping. Take 2-3 pieces of it in order to tame your appetite and also banish your craves till the next meal. A similar dessert consumed in moderate amounts will prevent the weight gain. Pamper your tasting buds with low calorie desserts and be prepared for healthy eating with the best recipes. Low Fat Tortilla Chips: These traditional Mexican foods will serve as the perfect means to preserve your silhouette as well as benefit of a delicious meal. Low fat tortilla chips can be consumed as the perfect snack during a long and exhausting day. These have all the vitamins and nutrients that are necessary to boost our energy. Additionally you can also prepare a bean garnish to it since it won't presuppose additional calories. Choose a favorite taste and pair it with healthy dips. Whole Grain Cereal: It is a common misconception that cereals are the top notch elements of a weight loss diet. The truth value of this statement should be limited indeed only to the unsweetened whole grain cereals that can be consumed without limit as the perfect substitute for stuffing snacks. 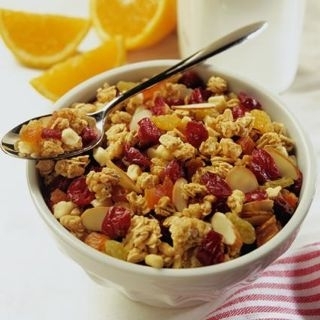 Bare cereal bars might seem boring after a short time, however be creative and add some fresh fruit slices to it. Be it banana, strawberries, apple or blueberries, dried fruits are just as perfect to complement the gustatory pleasure of your meal.